Yay! I wore my first hair accessory on Wednesday evening :D. I co-washed in the morning and encouraged myself to at least try doing a twist out. After getting out of the shower, I towel blotted as usual and sprayed some aloe vera + water to keep it damp. At first I used the rat tail comb to do partings but end up abandoning that cos the lines kinda got swallowed up anyways. So I did my flat twists as I usually do, and it was hard, my hair’s in different lengths, some areas too short to get into the twist but I persevered. My hair was drying quickly so had to keep spraying to keep it wet. I did some twists in different directions, horizontal and vertical, the horizontal ones in the front and middleish. At the end when some fluffs of hair were out of the twist I finger coiled them individually with some gel. After finishing each row, I put some gel over it then when done with them all, put some more gel all over my head. 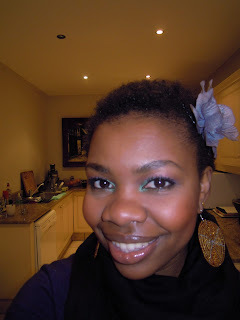 The aim was to sort of stretch out my hair and have a more defined curl throughout, not just my sides. I honestly wasn’t so optimistic cos it was looking kinda ratty. In the evening, about 20 mins before having to head out, I undid them. The hair looked weird, lol. Just natty looking and had some straight ends poking out (my little relaxed hair refuses to go, I’m constantly snipping away) so I thought, crap…lemme just put some leave-in conditioner, butter and do my massage thing, surely that’ll fix things. 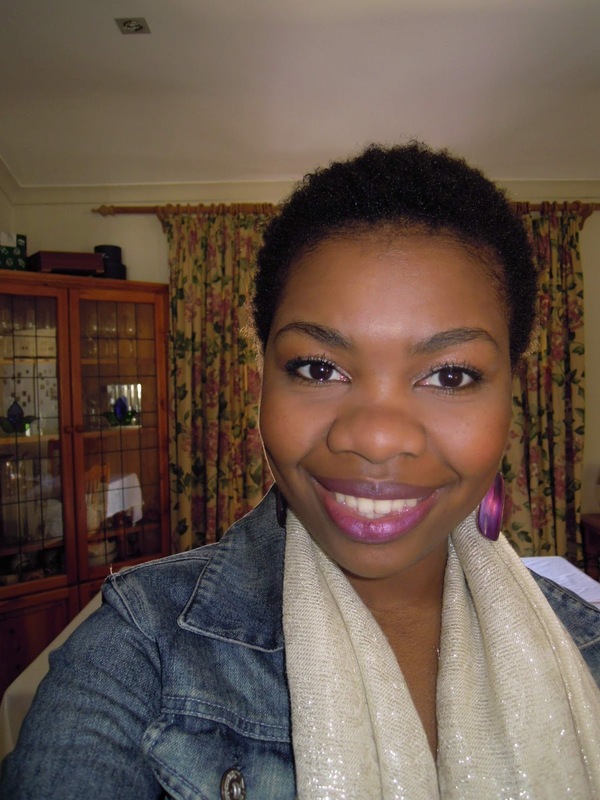 Et voila..my afro looked fuller and a bit “longer” and not as compact. It actually worked! So I just tried the flower to see how it looked and it looked cute, not as awkward when my hair was more compact looking :D.
To put the flower in, I wet the side of my hair with spritz and used my brush to slick the hair down. I put some gel on it, while pulling it taut and used my bobby pins to keep it in place. Then slid the flower in. I tidied up my edges with a bit of gel and toothbrush as usual. The next day, I didn’t wet my hair in the shower, I just sprayed some leave-in and butter and massaged. I didn’t have to massage it as much. My hair turned out nice and “clumpy” looking. I was especially happy with my front/top part cos it’s the stubborn bit that always doesn’t curl as much as the sides. My hair wasn’t hard or stiff. Wasn’t too soft either, I was happy with the texture. And throughout the day, I continued finger coiling some parts and it stayed…not unravelled as it usually does.